Posted by Bravado Cooking for Men in Fun Stuff. Get ready; it’s time for one of summer’s taste treats. 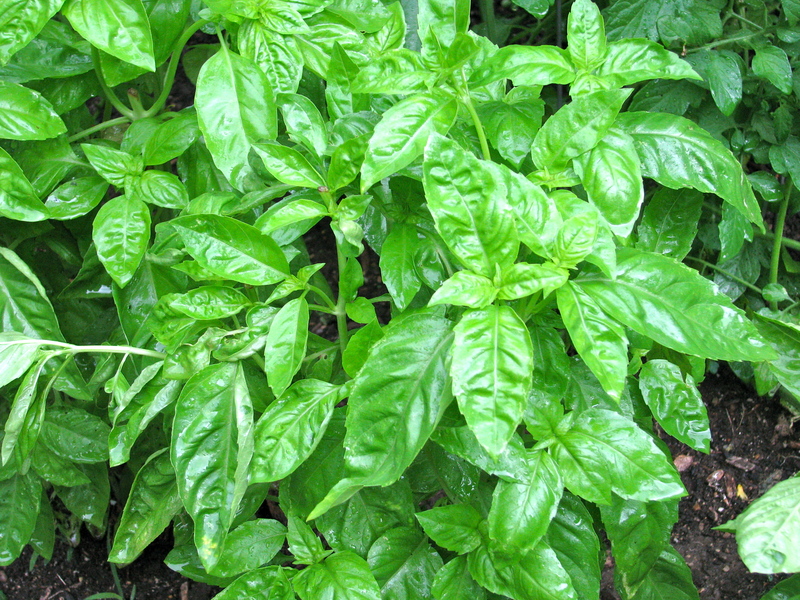 Although good quality basil is available in the Southern states for most of the year, those of us in the North have to wait until this time of year to enjoy the varieties of religious experience that come from this wonderful herb. If you grow your own, now is when it takes off. Farm stands and farmers markets have it in abundance. We have written so much about basil pesto in the past that I thought it would be fun to toss out some new stuff as well as review things from the past. We’ll create a “Pesto Primer” that you can print and keep under your pillow. If you want to wander on your own, go to the “Search” window above and enter “Pesto”. Everything will come up. You can put pesto sauce on anything and it works. It’s the WD-40 of cooking. Here are some of the recipes that we have discussed in previous posts and some new ideas. I have put links to the posts in case you are dying for more detail. Pesto with Shells or Tubes: My daughter has convinced me that shapes like tubes or shells that trap the sauce are better than spaghetti. I have to agree. Other things also work. Last night we tried it over spinach ravioli – very good -and I am anxious to try it with tortelini. 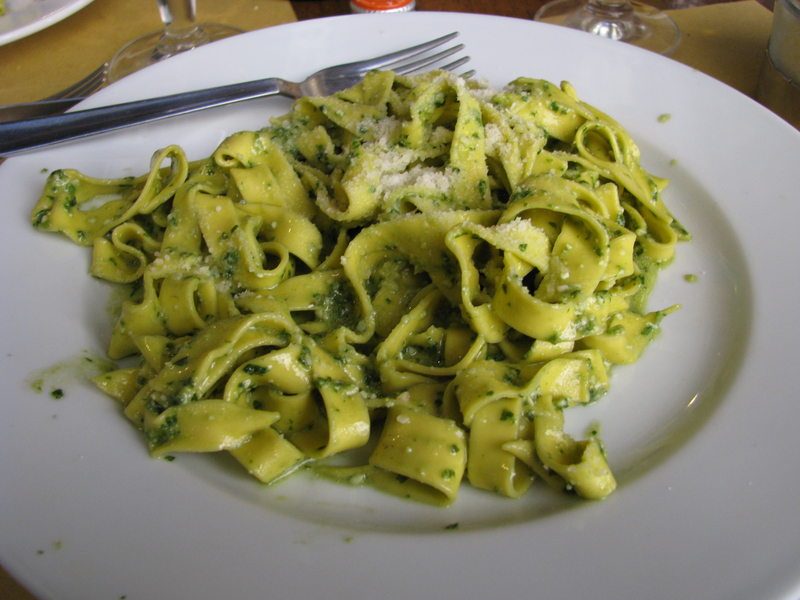 Pesto with Wide Noodle Pasta (Pappardelle or Tagliatelle): These wide noodles are now my favorite for pesto. They “grab” the sauce as well as the shells or tubes, but seem creamier. 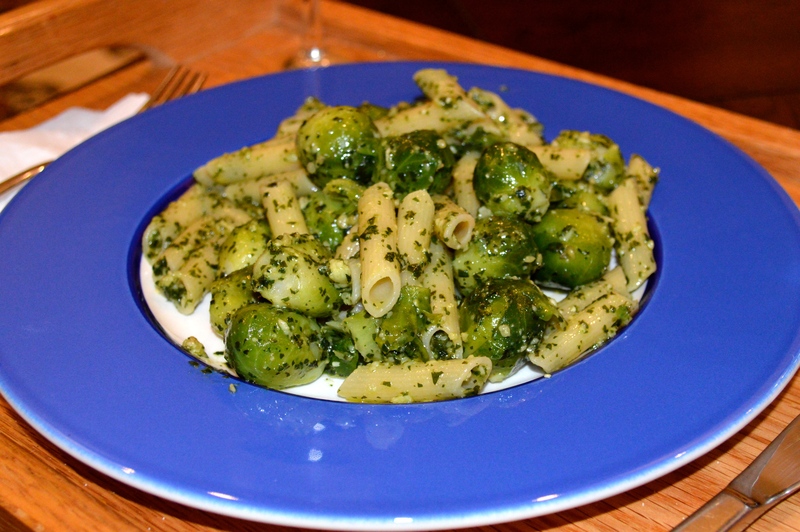 Pesto with Pasta and Vegetables: If you really want to go crazy, add other vegetables to the pasta. You can use anything, like sautéed egglplant cubes, peas, or, my favorite, Brussel sprouts. Cook the vegetables first, and then add them to the pasta and pesto. 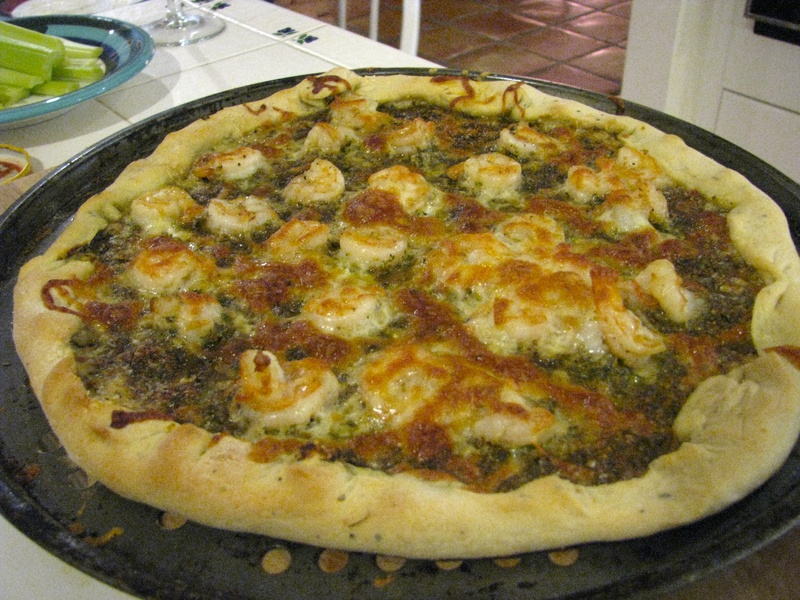 Pesto pizza with shrimp: Try to get small, uncooked shrimp. Peel them and make sure you dry them thoroughly with paper towel. Spread on top of the pesto sauce, add some red pepper flakes and a little mozzarella. Tasty! Pesto pizza with black olives: I was making pizza with my granddaughter and she loves black olives more than life itself. She also loves pesto. She insisted on carefully slicing a whole can of black olives, which she used to cover the entire pizza. A little mozzarella on top and we had a real winner. This is now my favorite pizza. Pesto and Salmon: You can go back to our post Salmon and Pesto for some interesting cooking techniques and information about salmon. 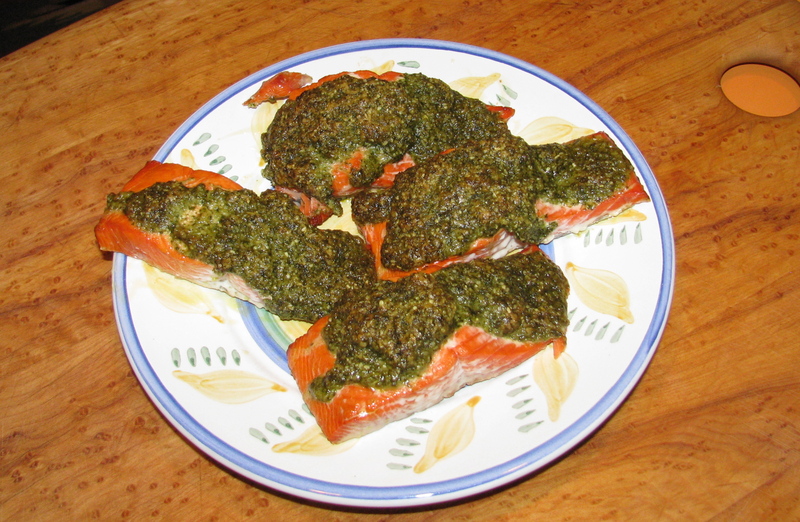 However, the idea is very simple – no matter how you cook salmon, spread pesto on it. You can put it on the fish while cooking or warm the pesto and spoon over at the table. Pesto with Pork Loin or Tenderloin: We often grill these meats in the summer and slice to serve. Try serving pesto sauce with them and you will be surprised. Pesto and Tomato Sandwich: This is my grandson Eli’s invention. 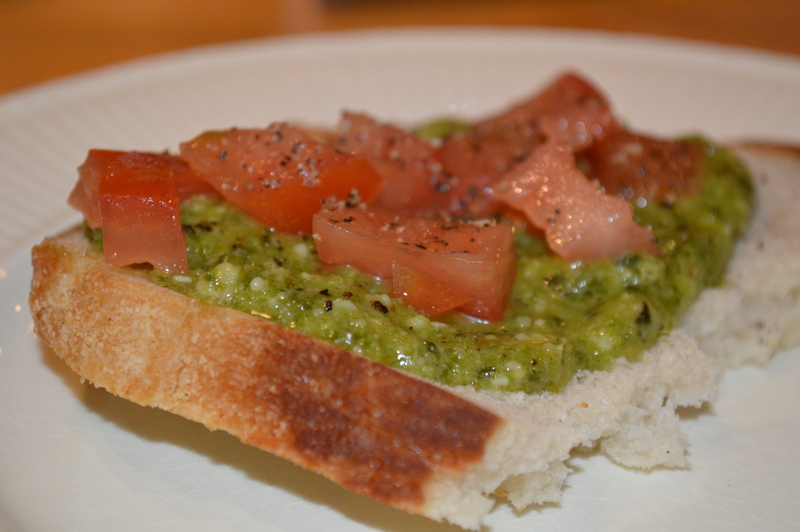 Take a piece of toast and spread pesto on top, scatter diced tomatoes on top, add a little salt and pepper and eat open-faced. This really works well with real summer tomatoes. 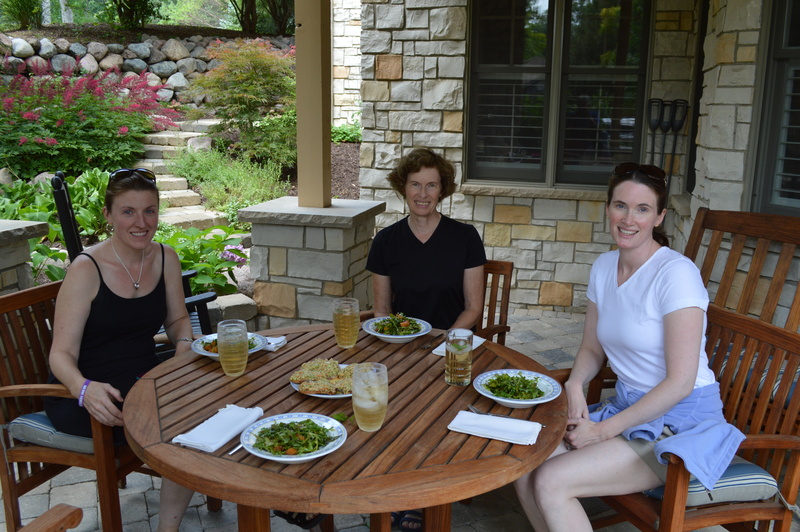 Salmon Salad with Pesto on Toast: I made an al fresco lunch for family and friends using some leftover Scottish salmon from the night before. 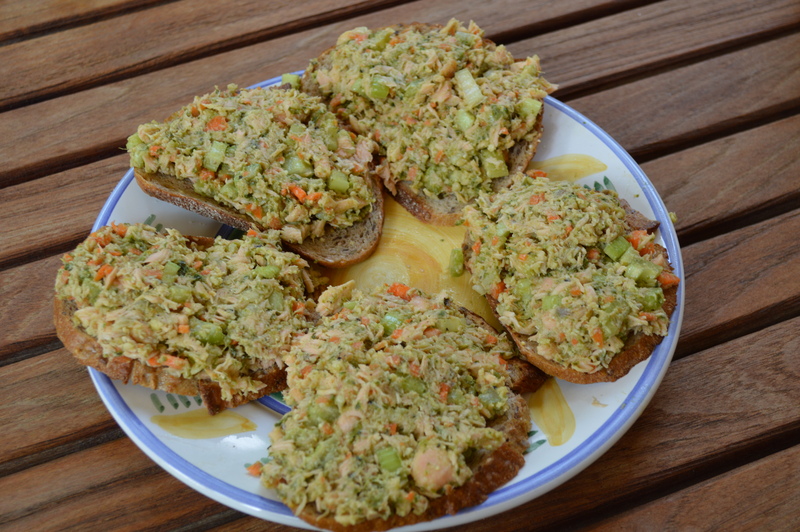 I chopped celery and carrot very fine, added the salmon and three spoonfuls of pesto. I mixed everything together and served on toasted whole wheat bread. Served with an arugula salad with melon on the side, it was a winner. 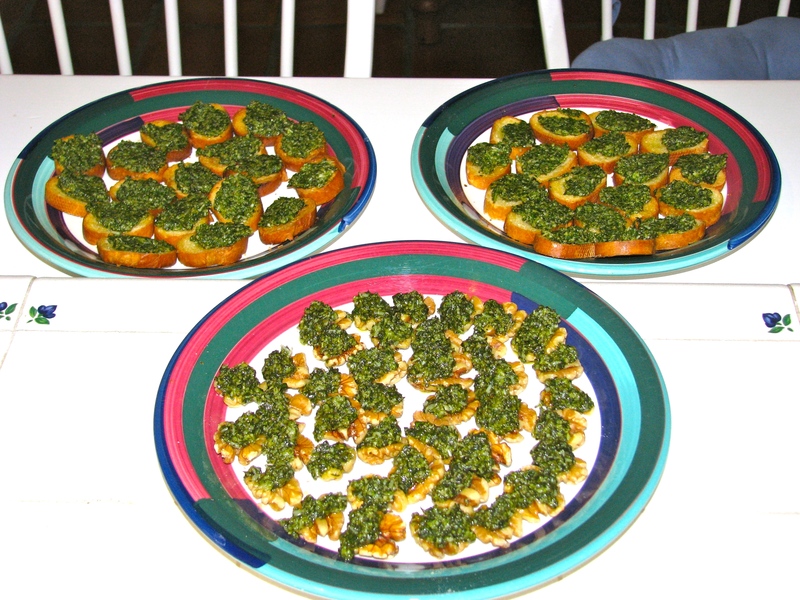 Pesto on Walnut Halves: This is a classy and unusual appetizer that never fails to wow the guests. The problem is finding unbroken walnut halves. As we said in Basil Pesto Redeux, “The best way (to do this is) to buy a 3 lb. bag of walnuts from Costco or other purveyor, open the bag and remove the approximately 10% of true walnut halves and save them for the big moment.” You need to add a little soft butter to the pesto sauce to thicken it up a little before spreading on the walnuts. Pesto on French Bread: The easiest of all. Either buy a fresh baguette or bake your own (French Bread – The Classic Baguette), slice thinly and spread with pesto. Serve on a pretty platter, preferably with champagne. 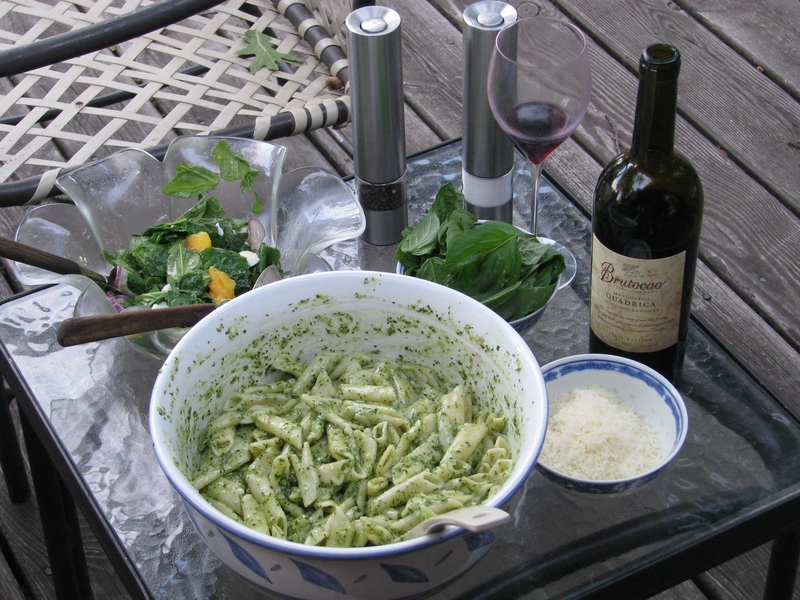 I would love to hear some of your favorite pesto recipes. Click the “Comment” button and let me know. I make some of these things for you this Fall. Welcome back Bill! Have you ever tried subbing pistachios for the pine nuts? Super yummy.